The Foxboro® brand PH12 Series Sensors are precision electrochemical sensors that are used with a popular set of mounting accessories to measure pH and ORP. 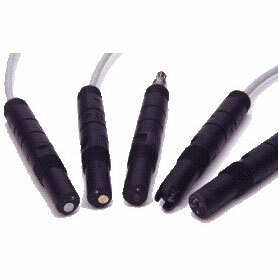 These sensors provide a unique electrode technology in the widely used 12 mm form factor, and provide fast response, long life, and high accuracy and stability. They are rugged, easy-to-use devices particularly well suited for low and high temperature, sanitary, and biocompatibility installations. The low cost construction renders the sensor disposable, and therefore eliminates costly sensor maintenance. Double junction reference using Nafion ion barrier. Fast thermal response; <1 minute for 80% step. PEEK or Borosilicate Glass sensor bodies. Variopin connector integral to sensor body. – For pH measurement: Domed glass electrode to 125 or to 140°C (to 257 or to 284°F); or flat ruggedized glass electrode to 125°C (to 257°F). – For ORP measurement: Platinum electrode to 125°C (to 257°F). – For combination (simultaneous) pH and ORP measurement: glass and platinum electrodes to 125 or to 140°C (to 257 or to 284°F), depending on glass electrode selected. Sanitary sensors comply with 3-A Standard 74; also meet FDA food processing industry requirements. Sensors meet the biocompatibility requirements of EN ISO 10993-5 and USP 87. ATC with integral 100 or 1000 Ohm platinum RTD. Steam sterilizable and autoclavable. Optional autoclave cap available to protect the variopin connections during the cleansing process. Standard Viton process seals; EPDM is optional. Integral PG 13.5 connection directly threads into a flanged or NPT process connection accessory. Retraction/Insertion and Ball Valve Insertion assemblies offered to allow insertion and replacement of sensor without shutting down the process. 316L ss, CPVC, or Kynar protective sensor holder assembly with or without electrode guard. Mounting accessories include threaded and Tri-Clamp type sanitary process connections, and NPT, NPT pipe adapter, and flanged process connections. Retraction/Insertion and Ball Valve Insertion assemblies are also offered. Cable strain relief housing accessory optional with Sensor Holder assembly; and provided as standard with the Retraction/Insertion assembly. Other accessories include junction boxes, patch cords, extension cables, raw cable, and flow chambers.